In 2012, the United Kingdom’s Department for International Development (DFID) launched its Innovation Hub (i-Hub). It thereby followed a trend among development actors who see innovation, broadly defined as generating new ideas leading to large-scale solutions, as crucial to increase the impact of their interventions. In the words of Judith Rodin, former long-time president of the Rockefeller Foundation, “Innovation alone will not solve all of the problems facing humanity, but we certainly won’t solve many without it” (2016:6). In contrast to mainstream innovation that does not pay attention to existing inequalities and can thereby exacerbate them, academics and practitioners are increasingly using the term “inclusive innovation” to describe innovation practices that explicitly aim to improve the lives of marginalized groups. Having subsumed terms such as “pro-poor,” “below-the-radar,” “grassroots,” or “frugal innovation,” inclusive innovation refers to “the inclusion within some aspects of innovation of groups who are currently marginalized,” either through products and services developed specifically for them, their incorporation into the innovation process, or support for their own grassroots innovation efforts (Foster and Heeks 2013: 335). This innovation turn is often joined by the embrace of humanitarian design, which is the application of design methods to development ends or—as designers would say—to change what is into what ought to be. Humanitarian design has its historical roots in longstanding alternative design traditions such as universal, ecological, or feminist design. E. F. Schumacher’s Small is Beautiful (1973) and Victor Papanek’s Design for the Real World (1984) called for the use of socially and environmentally responsible technologies and design. Papanek himself designed a 9-cent radio made of a used tin can and powered by wax or animal dung burned underneath it, which was distributed by UNESCO in India and Indonesia. The tin-can radio can be seen as an early humanitarian device and the forerunner of the hand-crank or solar-powered radios now ubiquitous in many places in the Global South. More recently, when Melinda Gates and Paul Farmer were asked what they saw as the innovation that is changing most lives in the developing world, they answered, “human-centered design,” in reference to a particular brand of humanitarian design advocated by IDEO.org (Wired 2013). IDEO.org is the nonprofit subsidiary of IDEO, a Silicon Valley–based international design consultancy that has been one of the most successful commercial entrants into the humanitarian design space. Its DesignKit website (www.designkit.org) provides popular online courses, field guides, and case studies. Through these free resources and articles in leading magazines such as the Stanford Social Innovation Review, IDEO has played an important role in legitimizing the participation of professional designers in the development enterprise. In the latter publication, IDEO Chief Executive Officer Tim Brown and IDEO.org Executive Director Jocelyn Wyatt argue, “Time and again, [development] initiatives falter because they are not based on the client’s or customer’s needs and have never been prototyped to elicit feedback” (Brown and Wyatt 2010:31). By branding its own approach as human-centered design (HCD), IDEO.org makes explicit—and appropriates more visibly than other organizations in this space—the critical centrality of user perspectives in humanitarian design. Part of the legitimation process of humanitarian design is redefining the development problem as a shortage of creative ideas, flawed system design, and preconceived notions of development practitioners (Schwittay 2014). In addition, advocates of humanitarian design point out that the complexity and fast-paced nature of today’s development challenges calls for innovative, creative, and integrative experts—designers in short—who are best placed to tackle the problem of persistent poverty. Part of their approach is to redefine common constraints, such as poor people’s inability to pay for necessary services, as “creative springboards” and to redefine poor people’s needs as (commercial) opportunities. This vision of development is based on a conceptualization of the poor as consumers and an individualization of infrastructural problems, both hallmarks of humanitarian goods. In 2014, DFID’s i-Hub contracted IDEO.org to the tune of £10 million to develop and implement its flagship program, Amplify (www.amplify.org). Amplify is a crowdsourcing platform aimed at engaging nontraditional development actors such as designers and other creative entrepreneurs, diaspora communities, technologists, engineers, and the public at large. It also wants to establish stronger connections between these actors and potential users of the development solutions generated via the platform. By definition, these users are constituted as poor to fit DFID’s mandate. Reflecting the hyperbole that often surrounds the uptake of innovation and design in development, Amplify’s business plan marketed the program to DFID senior management as a “platform [that] could galvanise truly transformational and unprecedented innovation by attracting new sources of expertise” and the use of collaboration (Amplify 2013). Indeed, Jonathan Wong, former head of i-Hub, reports that thanks to Amplify, HCD is diffusing across DFID and other UK government departments (IDEO.org 2016). This is also a process of making visible the informal and unseen practices already happening at the margins of many development organizations, of mainstreaming them and showing their potential contributions to DFID’s work. The Amplify platform has been adapted from the original OpenIDEO platform, which was built to stimulate “open innovation” and uses proprietary software and a Creative Commons license. Calling it an online platform rather than a website highlights such crowdsourcing devices as socio-technical spaces that enable diverse and dispersed groups of people to collaborate on joint projects. Amplify itself consists of eight challenges, with topics ranging from women’s safety in urban areas to improved refugee education to youth empowerment in East Africa and enhanced opportunities for people with disabilities. 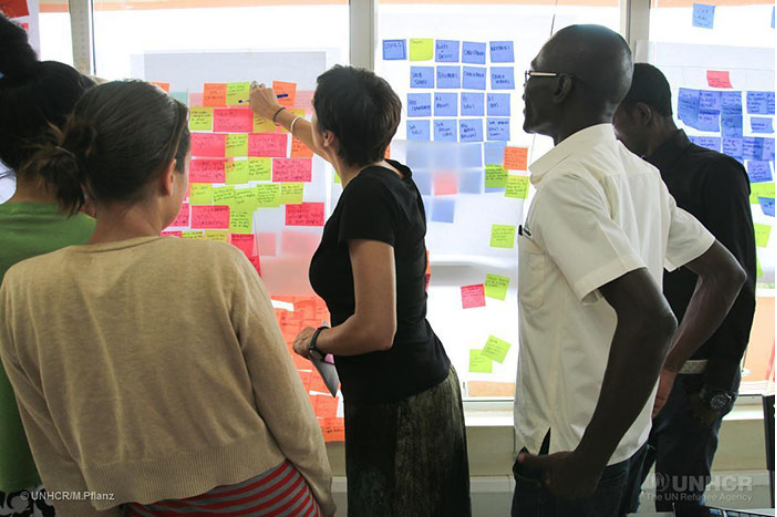 Each challenge goes through a four-month online process, at the end of which a handful of winners attend a design bootcamp, usually held in Nairobi or Kampala, and receive upwards of £100,000 in DFID funding and IDEO design support to implement their ideas. To date, seven challenges have been completed, which allows us to examine if and how the program’s use of open collaboration and humanitarian design have been changing DFID’s modus operandi. Our analysis is based on more than 2 years of qualitative research, encompassing in-person and Skype interviews with three DFID managers, five IDEO managers, and 15 participants, predominantly finalists of the first four challenges. We also conducted detailed numerical and discourse analysis of three challenges through online research and examined secondary materials such policy papers, a business plan, blog posts, YouTube talks, and online meet-ups. Fig. 2. Participants in the 2016 Amplify Bootcamp in Kampala, Uganda. Most obviously, the Amplify application process differs significantly from DFID’s traditional Requests for Proposals. The latter ask for precisely defined project descriptions and timelines, budgets, and objectives, all presented in development jargon that from the outset narrows the pool of applicants to those able to comply with these requirements. Instead, Amplify’s more flexible and open-ended process emphasizes learning and iteration. Most participants—theoretically anybody with an internet connection can set up a short profile and join the platform, although there are clearly structural constraints to participation—post preliminary ideas on the Web2.0-type website. There are a number of free-form text boxes where participants answer open-ended prompts such as, “Explain your idea,” ‘“Who benefits?” and “How is your idea unique?” In addition, dropdown menus provide more precise information about the participants themselves on, for example, years of experience in the country for which the idea is being proposed, expertise in the sector, and size of operating budgets. Although written text, which has to be in English, dominates the submissions, participants are also encouraged to embrace more visual language by posting photos and short videos. All shortlisted participants have to provide a user-experience map to chart how potential users of their idea would participate in the proposed project. Initial submission can easily be changed using a simple editing function in response to questions and comments from other participants and IDEO.org managers, which are displayed in a comment section. Fig. 3. 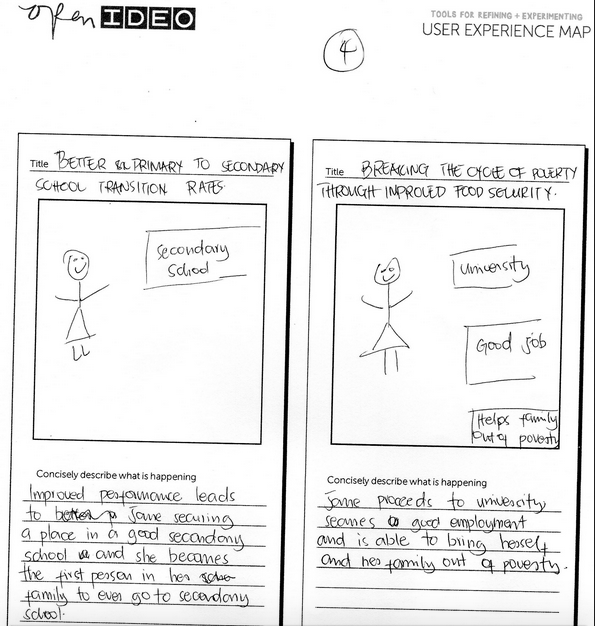 User experience map created by a Food for Education, a winner of the fourth challenge. This online process is structured according to the HCD process of Ideas–Feedback–Improvement, which asks that participants show how comments and other feedback are shaping the evolution of their ideas. Although this structure imposes its own logic, it is miles away from the conventional log frame (logical framework) used by many development organizations. Whereas log frames demand that information is presented in boxes, organized by technical terms such as input, outputs, and outcomes, the design process operates through freeform, flexible thinking and writing to produce more open-ended submissions. Several participants we interviewed welcomed this move toward a more realistic process for formulating and implementing development projects, which one participant described as “learning rather than proofing.” Such learning also takes place at the level of the program, as Amplify itself has been conceived as one large prototype where continuous adjustments are made from one challenge to the next. Amplify’s aim has always been to fund small organizations that DFID, which channels most of its aid through large international nongovernmental organizations (NGOs) or consultancies, is not usually able to support. An examination of the 30 winners of the first five challenges shows that just over half are nonprofit/NGO-type organizations, eight are social enterprises, three are professionals, and another three are design groups. 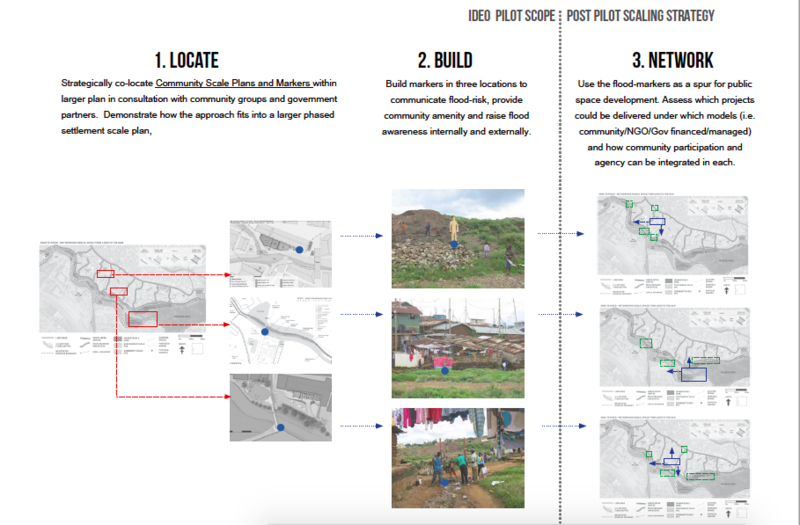 A group of New York University (NYU) design students won the first challenge with a project developed in collaboration with a Nepalese NGO they had met on the website; this was celebrated in a newspaper article as being exactly what Amplify was about (Leach 2015). However, an IDEO manager complained to us that the program should instead be supporting Kenyan design students and connecting them to Kenyan social enterprises. He was not so much objecting to the fact that funds went to the United States rather than target countries (most of the money was channelled via NYU to the Nepalese organization), but that the U.S. students did not know much about what is going on in Nepal. It is through such internal debates that small, community-based organizations have emerged as the “sweet spot” targeted by Amplify, showing how inclusive innovation and open collaborative practices can generate their own politics of exclusion. 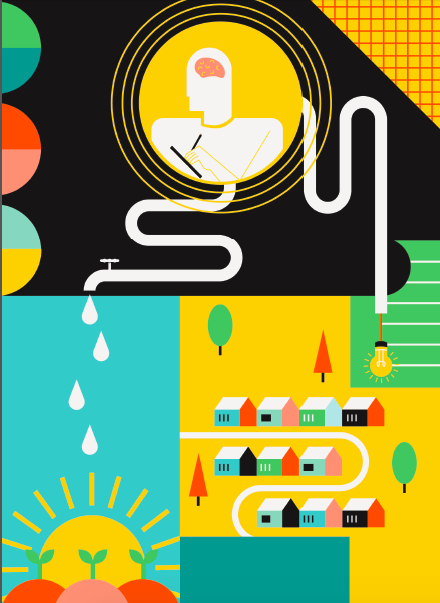 In the fourth challenge, a Kenya-based design group called KDI did win, with a project to work with Nairobi slum dwellers to redesign open spaces to prevent flooding. Fig. 4. Page from KDI’s pilot concept plan submitted to IDEO. i-Hub’s first head has described Amplify as “less like Encyclopaedia Britannica and more like Wikipedia” (Wong 2016:125). For him, development knowhow is no longer created in traditional centers of power, which instead “curate” knowledge production in multiple locations around the globe. However, the above description of what is new about the program also reveals some of its continuities with more conventional development regimes. Most important, Amplify expertise remains firmly situated in the Global North, with IDEO.org designers in New York and San Francisco, DFID managers in London, and unnamed subject experts who ultimately chose the winning ideas. This replication of authoritative development geographies can also be seen in the location of the finalists. Although all of the winners of the first five challenges are based in the Global South, 24 of 30 have a connection to the Global North, with 19 to the United States. Close to 50% of all winning projects are located in Kenya, despite the fact that 27 of DFID’s priority countries are eligible for Amplify support. The sixth challenge focused on four countries in East Africa only, narrowing down Amplify’s professed diversity to long-established sites of UK development interventions. Amplify is also subject to a tension at the heart of the design endeavor. On the one hand, there is an insistence that everyone is a designer because design is a fundamentally creative, human activity, which awkwardly stands counter to claims by professional designers that they possess the right qualifications, skills, and methods to solve the world’s problems. Although everybody who logs onto the Amplify website has to participate in its designer-y process, it is IDEO.org employees who are the program experts. Such an appropriation of expertise resonates with condemnations of humanitarian design as “soft cultural imperialism” operating through neoliberal narratives about poverty and the use of techno-scientific market devices to solve it (Johnson 2011:463). However, one characteristic of humanitarian design is precisely the ever-closer entanglement of markets and morals (Redfield 2016). In addition, it is Silicon Valley’s techno-utopian and libertarian values that shape Amplify’s operations and thereby seep into broader international development efforts. Accordingly, Amplify’s business plan celebrates its “start small, test, and fail early” mentality (Amplify 2013). Continuous experimentation is encouraged throughout the online process and especially among finalists. In our interviews, some participants recognized the challenges that such an experimental logic can present in the complex world of development, where vulnerable livelihoods leave little room for creative destruction. There is also a qualitative difference between the beta version of the latest geolocation app failing in tests with a consumer focus group, and the implications of discontinuing a project that was providing important community services. In one case, Amplify managers urged a finalist to introduce a new employment skills project requiring substantial upfront investment in equipment against the finalist’s own judgment that it would not be economically sustainable in the long run. Having to abandon the project after the three-month period supported by a small Amplify grant resulted in confusion and disappointment among its users. The organization’s own frustration echoes critiques that humanitarian designers, in their search for marketable innovations, sometimes do not pay enough attention to financial sustainability and organizational cultures (Mulgan 2014). Above all, Amplify operates as a micro-social generator, incubating interventions at a micro scale. It combines the qualities of a social networking platform (like Facebook/Linkedin) with the features of an open-editable content platform working through the small contributions of numerous individuals and groups and overseen by a group of administrators (like Wikipedia). By design, it supports small organizations producing local solutions that improve the lives of individuals, their families, and their neighborhoods. On the one hand, this results from the nature of design. DFID managers recognized in our interviews that design can only tackle more technical problems, and Amplify was always aimed at particular locales rather than universal coverage. This is not to say that it does not have global ambitions, as scalability is something experts look for in winning ideas. Indeed, one finalist of the Refugee Education challenge, a Jordanian organization called We Love Reading, is aiming to build a global movement to get more children to read for pleasure. But it also remains firmly rooted in its local origins: it started in a neighborhood mosque in Amman, and works through one reading circle at a time. Fig. 5. 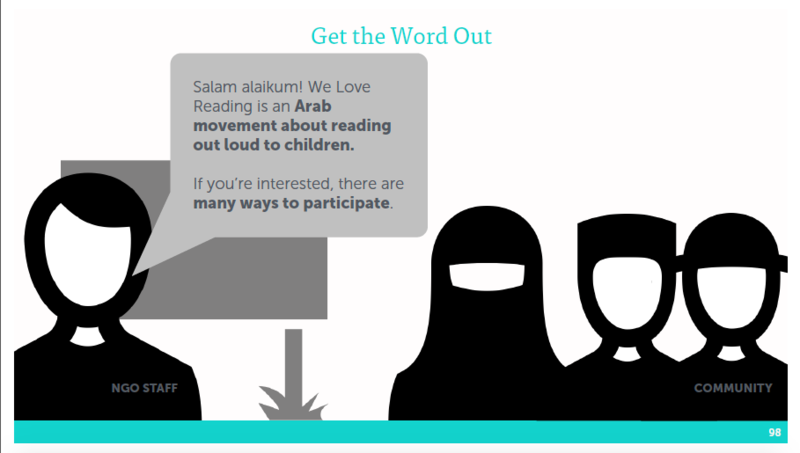 Image from presentation prepared by IDEO.org for We Love Reading. On the other hand, micro is the scale of humanitarian devices, and similar to these devices, most winning ideas on Amplify advocate for solutions standing apart from state infrastructures or authorities. Working at an individualized and individualizing level, they deploy technical minimalism in the face of immediate needs. They also often create “micro-scale market opportunities” while presenting “small…approaches to social change” (Redfield 2016:179). How has this translated into the production of humanitarian goods? Among the winners were certainly devices that fit the inclusive innovation remit with its focus on newness: a clean birth kit for poor Indian mothers, a biogas-powered milk chiller for Tanzanian farmers, novel storage solutions for Ethiopian market vendors, a market-matching chatbot connecting Kenyan poor farmers with buyers, and a peer-to-peer SMS-based information network to alert Jakarta inhabitants to floods. But the great majority of winning projects have been quite conventional, from employment training schemes to microfinance to community health initiatives and educational programs. This reflects Amplify managers’ self-professed scepticism towards technological silver bullets and existing expertise within DFID more broadly, which ultimately limits what can be funded. Equally important, because of the organization’s value-for-money mentality stemming from its fiscal responsibility to UK taxpayers, initial blue-sky thinking has made way to safer ideas and organizations. Has this resulted in poor—rather than pro-poor—innovations, foregoing breakthroughs for incremental change? Although Amplify’s outcomes might be familiar, the process by which they have been achieved is certainly new to DFID, many of the winners, and the platform’s observers. And what if we regarded design as a particular, “remedial” approach to changing situations whose status quo cannot be accepted, as suggested by Bruno Latour (2008)? Then, rather than being revolutionary, humanitarian design can be seen as careful in a double sense: on the one hand it can only present limited solutions to clearly circumscribed problems, and on the other it is infused with an ethics of care that accords well with the affective dimension of contemporary humanitarianism and the popular embrace of poverty alleviation causes. It can be seen as an approach to international development whose practitioners wonder whether they are asking the right questions where others have ready-made answers, who examine the assumptions that most development interventions take for granted, and who hold in view the messiness and complexity of any project of change, ultimately recommending to proceed with caution. Likewise, for researchers of these approaches, rather than subscribing to the well-trodden critique of neoliberal market dominance, might an agnostic stance that explores their potential while acknowledging their limits be more productive? Amplify. 2013. Business Plan. Available at link. Brown, Tim, and Jocelyn Wyatt. 2010. “Design Thinking for Social Innovation.” Stanford Social Innovation Review 8(1):31–35. Foster, Christopher, and Richard Heeks.2013. “Conceptualising Inclusive Innovation: Modifying Systems of Innovation Frameworks to Understand Diffusion of New Technology to Low-income Consumers.” The European Journal of Development Research 25(3): 333-355. IDEO.org. 2016. Impact: A Design Perspective. Available at link. Johnson, Cedric. 2011. “The Urban Precariat, Neoliberalization, and the Soft Power of Humanitarian Design.” Journal of Developing Societies 27(3–4):445–475. Latour, Bruno. 2008. “A Cautious Prometheus? A Few Steps Towards a Philosophy of Design (with Special Attention to Peter Sloterdijk).” In Proceedings of the 2008 Annual International Conference of Design History, pp. 2–10. Boca Raton, FL: Universal Publishers. Leach, Anna. 2015. “Collaboration Not Competition: Could This Be the Future of Development?” The Guardian, April 14. Available at link. Mulgan, Geoff. 2014. “Design in Public and Social Innovation: What Works and What Could Work Better.” Available at link. Papanek, Victor. 1984. Design for the Real World: Human Ecology and Social Change. Chicago, IL: Academy Chicago Publishers. Redfield, Peter. 2016. “Fluid Technologies: The Bush Pump, the LifeStraw® and Microworlds of Humanitarian Design.” Social Studies of Science 46(2):159–183. Rodin, Judith. 2016. “Foreword.” In Innovation for International Development: Navigating the Paths and Pitfalls, edited by Ben Ramalingam and Kirsten Bound, pp. 6–7. London, UK: NESTA. Schumacher, Ernest Friedrich. 1973. Small is Beautiful: A Study of Economics as if People Mattered. US: Random House. Schwittay, Anke. 2014. “Designing Development: Humanitarian Design in the Financial Inclusion Assemblage.” PoLAR: Political and Legal Anthropology Review 37(2): 29-47. Wired. 2013. Interview with Melissa Gates and Paul Farmer. Available at link. Wong, Jonathan. 2016. “From Britannica to Wikipedia: How Traditional Development Players Are Catalysing Collaboration for Innovation.” In Innovation for International Development: Navigating the Paths and Pitfalls, edited by Ben Ramalingam and Kirsten Bound, pp. 120–130. London, UK: NESTA.